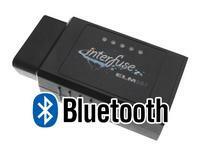 Locate and enable Bluetooth on your Smartphone or Tablet. Click the Menu icon, click Settings, click Wireless & Networks, and finally click Bluetooth Settings. It may show up as 00:13:EF:00:0A:69 or similar but will resolve to OBD-II or similar. If scan results come up empty, unplug the interface and plug it back in and be sure you in transmission range of the Bluetooth signal. If this continues, try it in another vehicle. Install the ELM327 app of your choice. We suggest Torque Free for Android, you can find this in Google Play. Open the app and proceed to set the software up to connect to your OBD-II diagnostic tool. In Torque you will need to select the Bluetooth Device from the preferences menu. Go Online with your vehicle to begin collecting real-time data and trouble codes from the ECU. The process for each software package will be different but is generally self-explanatory.